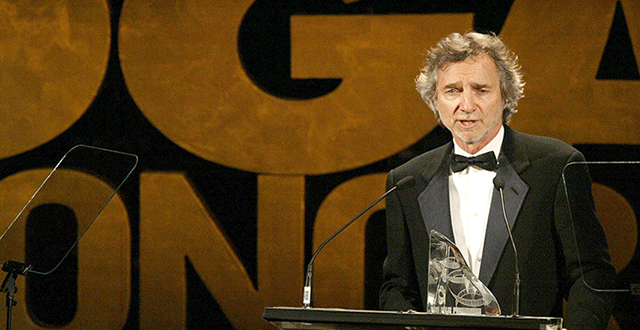 As part of the 4th Annual DGA Honors, the Directors Guild of America and The Film Foundation honored Curtis Hanson with the Film Preservation Award for his commitment and dedication to film preservation, at the Waldorf-Astoria in New York City on November 16, 2003. The DGA holds this annual gala to celebrate and recognize individuals and organizations that have made outstanding cultural contributions to film and television production. In addition to Curtis Hanson, filmmaker Robert Altman, AFL-CIO President John J. Sweeney, and Maine Senator Olympia Snowe were recognized. The USC School of Film and Television received a donation to its scholarship fund in recognition of the continued excellence of their department. TFF Artists Rights Council member Miloš Forman presented the award to Curtis Hanson. Prior to the presentation, Donald Sosin, composer and acclaimed silent film accompanist, played an original piece to the clip from the silent film, MY BEST GIRL (1927, d. Sam Taylor), restored by UCLA and funded by The Film Foundation and the Mary Pickford Foundation. Picture: Curtis Hanson receives the inaugural 2003 Film Foundation Film Preservation Award at the DGA Honors in New York City. Hanson was honored for his long-time commitment to, and support for, the issue of film preservation.